Hendra virus is an invariably fatal disease in horses that also can spread across to humans. Of the 9 recorded cases in humans, 5 have been fatal. Of the people that have survived, generally their health and quality of life is quite diminished. 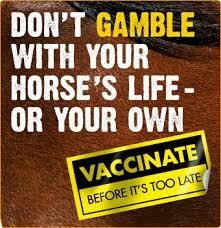 Signs seen in horses affected are high temperatures, respiratory signs and neurological signs. Fortunately there is a very safe, reliable and effective vaccine available. Contact us to discuss the disease and make an appointment.